The wind whipped across the banners that formed a row of color stretching the length of the field. The line represented the full measure of her province’s strength. Would it be enough to hold the castle? It would have to be. Her honor depended on it. Rokugan is a land filled with spirits, beauty, and strife. Seven great clans inhabit this diverse realm, ever loyal to the Emperor, but ever fighting for dominance among themselves. As they battle for supremacy, the daimyōs who lead their people must use all their cunning and skill to gather information, anticipate their opponent’s actions, and lay battle plans that will lead them to victory. Only one can prove themselves worthy enough to become the true voice of this land and usher Rokugan into an age of prosperity. 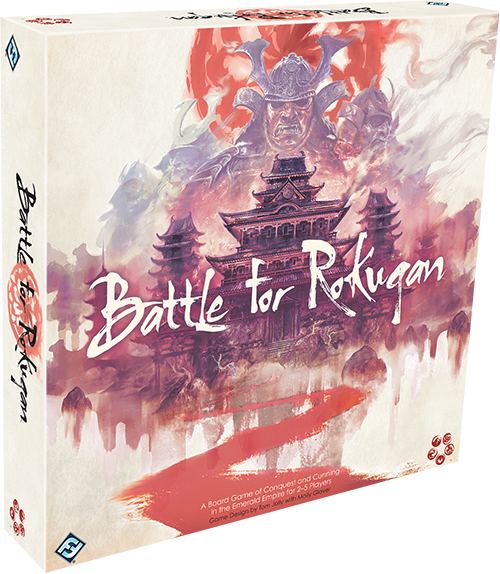 Fantasy Flight Games is proud to announce the upcoming release of Battle for Rokugan, a new strategic board game based in the Legend of the Five Rings universe! Battle for Rokugan puts two to five players in the roles of Rokugani daimyō fighting for territory in the early days of the Emerald Empire. 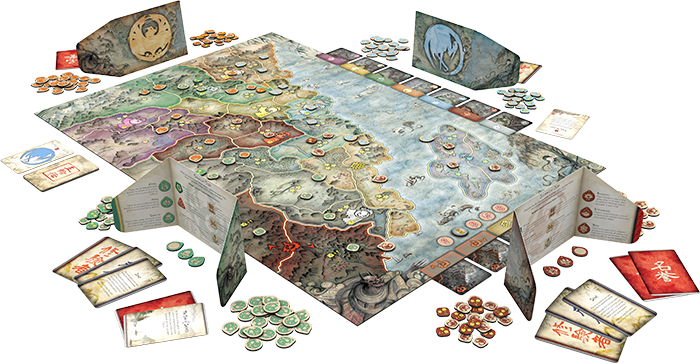 The beautifully illustrated game board transports players to this new world that is ripe for the taking. The land of Rokugan is divided into territories that belong to each of the seven honorable clans: Crab, Crane, Dragon, Phoenix, Lion, Scorpion, and Unicorn, that have been battling for dominance since their foundation by the Kami. Past the safety of these provinces' walls lay several unclaimed territories, including the mysterious Shadowlands that beckon to those who desire power no matter the cost. The players' ultimate goal is to conquer as many of Rokugan's provinces as possible to gain honor for their clan and prove that their people are truly superior, and the only clan fit to guide the Empire. Each territory contains provinces that serve as battlegrounds for the daimyō. With each province claimed in the name of their clan, the daimyō gain honor that will be weighed against that of their rivals at the end of five rounds of play. Should these leaders claim all the provinces within a territory, they also gain special abilities that can be used to either bolster their clan’s strength or sabotage their enemies' plans. By taking control of these territories, the clan leaders of Rokugan hope to prove their clan's superiority and bring the Emperor's favor to their people. Before the battle begins, players pledge their sword to one of the great clans and gain its special ability, daimyō screen, and control tokens. One of these tokens is placed on the clan’s capital, located in the heart of their province. From here, the daimyō begin their struggle to spread their clan’s influence by placing control tokens in the center of any unclaimed province. Among these are the forbidden Shadowlands—single-province territories with a significant defense bonus. 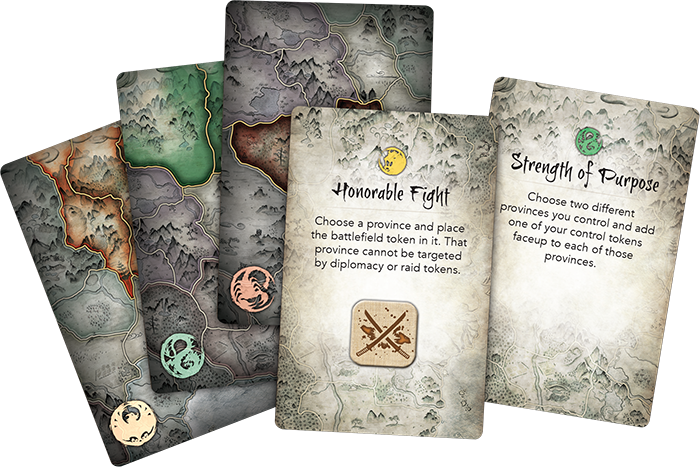 Both the north and south provinces of the Shadowlands have two powerful territory cards, despite only containing a lone province. However, taking these dark territories comes at a high cost for a daimyō. While the power they offer is formidable, their use does not garner favor with the Emperor, providing players with no honor. It is up the daimyō to decide whether the dark power these lands provide is worth the price of their morality. Battle for Rokugan is played over a series of five rounds, each consisting of three phases: upkeep, placement, and resolution. At the beginning of the upkeep phase, the daimyō determine the first player through the initiative deck and draw combat tokens. Each daimyō has a secret hand of six tokens that may be used to bolster defenses, seek peace or a divine blessing, bluff, initiate military attacks, or raid a province and leave nothing but ash. Once their forces have been gathered, each daimyō may use any territory cards that might aide their pursuit of power and begin to form their battle plans. During the placement phase, the clan leaders of Rokugan seek to expand their territory by placing combat tokens. The daimyō must balance their resources to fortify their defenses, attack neighboring clans, and engage in diplomacy. A rash strategy that focuses solely on one aspect, such as pursuing military conquest while leaving one’s province undefended, might grant you some early, and important victories, but can just as easily lead a clan to ruin. The placement phase is also when the daimyō may utilize scouts and shugenja to gather information on their opponents’ battle plans. After the clans have prepared and battle plans have been set, the resolution phase begins. When the resolution phase commences, players reveal their combat tokens, returning bluff tokens to their daimyō, and resolve their conflicts. First, the clans send out their raiding parties to destroy any province they wish to prevent their enemies from gaining. Next, the daimyō attempt to settle claims through the use of diplomacy. Finally, if no other course of action remains, the clans will engage in battle. Each time a province is successfully defended, the defender places one of their clan tokens in that province to further defend it from future attacks. However, if the daimyō’s defenses fail, they cease to rule the province and control passes to the attacking clan. Once the dust has settled and all battles have been resolved, players who control all the provinces within a territory claim the territory card for that region. These provide daimyō with single-use abilities that they may resolve during the upkeep phase to further strengthen their hold on the realm. 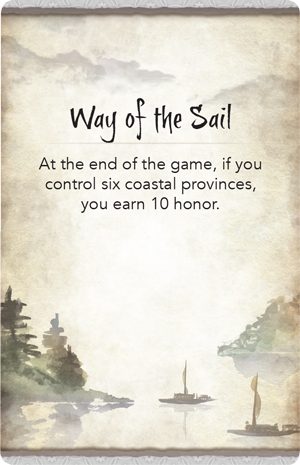 However, if a player has lost all their provinces and has no control tokens on the board, they become wandering ronin who must fight to regain their land and honor. During a ronin’s placement phase, they may place army tokens on any land border, but without a home or influence, the ronin cannot play raid or diplomacy tokens. This continues until the ronin is able to reclaim a province. As the Battle for Rokugan rages on, more than one group is bound to be lost in the clans’ fight for dominance. At the end of five rounds, the daimyō must agree that enough blood has been spilt and determine who is the most honorable leader, the worthiest of ruling Rokugan. Each daimyō reveals their secret objective card and determines their total honor by accounting for each of their faceup control tokens, provinces, territories, and whether they have completed their secret objective. The most honorable clan gains control of the Emerald Empire, wins the favor of the Emperor, and ensures their clan’s place in the annals of Rokugan. If you are strong enough to seize control of Rokugan, you can end the strife that has plagued this realm since its founding and prove the superiority of your clan in the process. Plan your conquest, outwit your rivals, bring honor to your people, and claim Rokugan in the name of your clan! Preorder Battle for Rokugan (L5B01) from your local retailer or online here! Battle for Rokugan is an upcoming board game that transports players to the early days of the Emerald Empire. Two to five players become the mighty daimyō, seeking to conquer the realm and bring honor to their clans. Make your claim, lay your battle plans, and make Rokugan bend to your will!